The National Gardens Athens in Greece are a wonderful hang out spot as well as a meeting point for the locals. It located near Syntagma metro station and right next to the Greek parliament. Tourists will appreciate the lovely landscaping and the shady trees after a tiring day of sightseeing. It is not often that you will see lovely Washingtonia Palm trees in lush green gardens but this is one of the places you do. National garden Athens two duck ponds which are a refreshing sight for the eyes. The sprawling area also houses a botanical garden and a zoo. Athens gardens lovely flowers and the grass are a wonderful place to hang out and laze around in the afternoons. The Zapeiion which is an impressive building to see is also inside the park. A walk around to explore romantic shady corners, hidden benches, beautiful flower pergolas, ancient columns and lovely little brooks at this scenic place is sure to be refreshing whether in the morning or the evening. The beautiful National Gardens were a part of the Royal Palace and were created by Queen Amalia, wife of Otto, and German agronomist Friedrich Schmidt in the year 1840. This 15.5-acre park houses over 7000 trees of 500 species of plants and many aquatic animals. This garden is also home to the famous sun-dial which indicated the time depending on the shadow of the hand. The National Gardens also has a conservatory, a children’s library and a small cafe where you can enjoy a cup of coffee while reading your favourite book. As you take your excursions through the beautiful city of Athens, reserve some time to visit the beautiful Athens National Gardens. There are no tickets for National Gardens, however, if you buy tickets for National Gardens tours, you get to see the whole place from an insider’s perspective. Also, you beat the lines and have an easy access as well. Getting your National Gardens Athens Tickets will assure you a fun and enlightening time. National Gardens Ticket prices for tours may also vary in terms of combination with other attractions. How popular is National Gardens? People normally club together Temple Of Olympian Zeus and Syntagma Square while planning their visit to National Gardens. 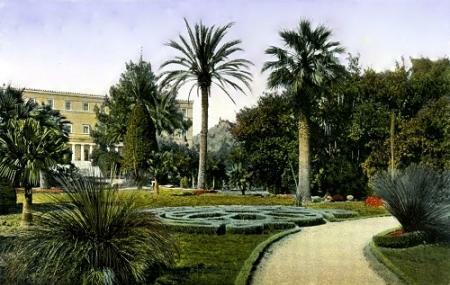 A huge botanical garden in the centre of the city. Great to go for a walk on weekends for families, couples, friends, do some yoga or anything else. Or just chill at the benches, there a lot of them. Park has many exotic plants, lake with cute ducks, also you may see peacocks, goats, rabbits and parrots. A small oasis in the heart of Athens, ideal for long walks during warm days. There's a long story behind its creation that you should go through. It could be better preserve but still provides lots of info and shade to it's visitors. Place looks really nice Everything is well organized, clean. You can see different plants and some animals there. For your comfort there are some maps in the garden which help you not to get lost. This used to be the gem of our city, designed as a botanical garden which included flora and fauna from every corner of our planet. Sadly, it is not well maintained at all and most of the exotic species were moved out or left to perish. It still is the best park you can visit in central Athens as it is quite large for Greek standards and couldn't be more central. Definitely worth the visit if you want to relax and break away from the noise and heat when it's too hot in the city.